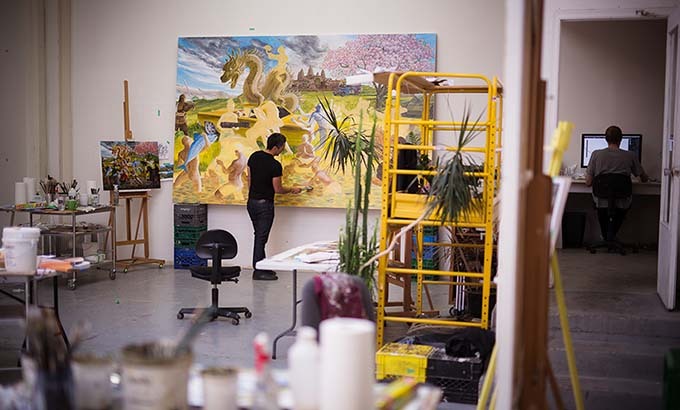 Join Mercer Union for a studio visit with Kent Monkman. Kent Monkman is a Canadian artist of Cree ancestry who works with a variety of mediums, including painting, film/video, performance, and installation. He has had solo exhibitions at numerous Canadian museums including the Montreal Museum of Fine Art, the Museum of Contemporary Canadian Art in Toronto, the Winnipeg Art Gallery, and the Art Gallery of Hamilton. He has participated in various international group exhibitions including: The American West, at Compton Verney, in Warwickshire, England, Remember Humanity at Witte de With, Rotterdam, the 2010 Sydney Biennale, My Winnipeg at Maison Rouge, Paris, and Oh Canada!, MASS MOCA. Monkman has created site specific performances at the McMichael Canadian Art Collection, The Royal Ontario Museum, and at Compton Verney, he has also made Super 8 versions of these performances which he calls “Colonial Art Space Interventions.” His award-winning short film and video works have been screened at various national and international festivals, including the 2007 and 2008 Berlinale, and the 2007 Toronto International Film Festival. His work is represented in numerous public and private collections including the National Gallery of Canada, the Denver Art Museum, Montreal Museum of Fine Arts, Museum London, the Glenbow Museum, the Museum of Contemporary Canadian Art, the Mackenzie Art Gallery, the Art Gallery of Ontario, the Smithsonian’s National Museum of the American Indian and the Vancouver Art Gallery. He is represented by Pierre-François Ouellette art contemporain in Montreal and Toronto, Trepanier Baer Gallery in Calgary and Peters Projects in Santa Fe.